To function properly, BlueTEC exhaust gas aftertreatment must be operated with the reducing agent DEF. When the supply of DEF is almost used up, the Check Additive See Operator's Manual message is shown in the multifunction display. When the DEF supply drops to a minimum, the Remaining Starts: 16 message is shown in the multifunction display. If the Remaining Starts: 16 message appears in the multifunction display, you can start the engine another 16 times. If DEF is not refilled, you will subsequently be unable to start the engine. Refill the DEF tank with approximately 1 gal (3.8 l) DEF. Have the DEF tank refilled at a qualified specialist workshop. If you drive the vehicle faster than 10 mph (16 km/h), the Check Additive See Operator's Manual message goes out after approximately one minute. up. If DEF is frozen and there is an active warning indicator, it may not be possible to add DEF. Park the vehicle in a warmer place, e.g. in a garage, until DEF has become fluid again. It will then be possible to add DEF again. Alternatively, have the DEF tank refilled at a qualified specialist workshop. Further information about BlueTEC exhaust gas aftertreatment and DEF is available at any authorized Mercedes-Benz Center. DEF is a water-soluble fluid for the exhaust gas aftertreatment of diesel engines. It is: • not poisonous • colorless and odorless • not flammable When you open the DEF container, small amounts of ammonia vapor may be released. Ammonia vapors have a pungent odor and are particularly irritating to the skin, to mucous membranes and to the eyes. You may experience a burning sensation in your eyes, nose and throat. Coughing and watering of the eyes are possible. Do not inhale ammonia vapors. Fill the DEF tank only in well-ventilated areas. DEF must not come into contact with your skin, eyes or clothing and must not be swallowed. Keep DEF away from children. If you or other persons come into contact with DEF, observe the following: • Rinse DEF from your skin immediately with soap and water. • If DEF comes into contact with your eyes, immediately rinse them thoroughly with clean water. Seek medical assistance without delay. • If DEF has been swallowed, rinse your mouth out immediately. Drink plenty of water. Seek medical assistance without delay. • Change out of clothing contaminated with DEF immediately. Only use DEF in accordance with ISO 22241. Do not mix any additives with DEF, and do not dilute DEF with water. This may destroy the BlueTEC exhaust gas aftertreatment system. The vehicle must be parked on level ground to fill the DEF tank. The DEF tank can only be filled as intended with the vehicle parked on a level surface. This avoids false level readings. Filling the tank is not permitted if the vehicle is not parked on a level surface. There is a danger of overfilling, which could result in damage to components of the BlueTEC exhaust gas aftertreatment. Rinse surfaces that have come into contact with DEF immediately with water or remove DEF using a damp cloth and cold water. If the DEF has already crystallized, use a sponge and cold water to clean it. DEF residues crystallize after time and contaminate the affected surfaces. DEF is not a fuel additive and must not be added to the fuel tank. If DEF is added to the fuel tank, this can lead to engine damage. For further information on DEF, see . The fuel filler flap is unlocked or locked automatically when you open or close the vehicle with the SmartKey or with KEYLESSGO. ■ Switch the ignition off. ■ Press the fuel filler flap in the direction of arrow 1. The fuel filler flap swings up. ■ Turn blue DEF filler cap 2 counterclockwise and remove it. DEF filler cap 2 is secured with a plastic strip. Only screw on the DEF refill bottle handtight. It could otherwise be damaged. ■ Unscrew the protective cap from DEF refill bottle 1. ■ Place DEF refill bottle 1 on the filler neck as shown and screw it on clockwise until hand-tight. ■ Press DEF refill bottle 1 towards the filler neck. The DEF tank is filled. This may take up to one minute. When DEF refill bottle 1 is no longer pressed, filling stops and the bottle may be taken off again after being only partially emptied. ■ Release DEF refill bottle 1. ■ Turn DEF refill bottle 1 counter-clockwise and remove it. ■ Screw the protective cap onto DEF refill bottle 1 again. DEF refill bottles can be obtained at many gas stations or at an authorized Mercedes-Benz Center. Refill bottles without a threaded cap do not provide overfill protection. DEF may leak if overfilled. Mercedes Benz offers special refill bottles with a threaded seal. These are available at any authorized Mercedes-Benz Center. 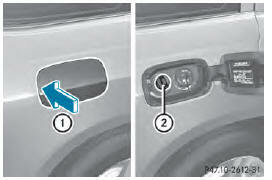 ■ Mount DEF filler cap 2 on the filler neck and turn it clockwise. ■ To close the fuel filler flap, press it in the direction of arrow 1. ■ Drive faster than 10 mph (16 km/h). The Check Additive See Operator's Manual message goes out after approximately one minute. If the Check Additive See Operator's Manual message continues to be shown in the multifunction display, you must add more DEF.